Liberal is the one and only WAC champion in girls basketball in 2018. Liberal overcame a desperate Dodge City run to win 53-46 at the Dodge City Fieldhouse Thursday night. It’s Liberal’s first back to back WAC titles since 1999-2000. The Lady Red jumped all over the Lady Red Demons to lead 26-5 early in the second after it was 20-4 after one. 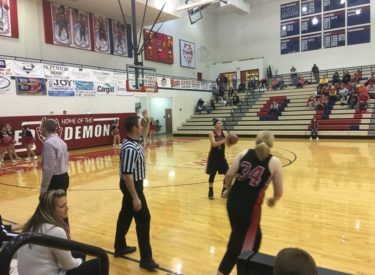 The Lady Demons outscored Liberal in the second quarter 20-14 and 13-4 in the third as foul trouble mounted on the Lady Skins. But LHS righted the ship in the fourth quarter to out pace DCHS 15-9. Whitney Hay and Ali Lucero hit the clutch shots of the game. With Liberal up one, Hay nailed a right wing three pointer to turn a 43-41 game into a 46-41 game. With the Lady Redskins clinging to a two point lead 48-46, Ali Lucero buried a right corner three pointer to make it 51-46 with 1:21 to play. Machia Mullens shrugged off foul trouble for 13 points and Katie Horyna added 13. Lucero dropped in 12. LHS shot 46 percent and Dodge shot 36 percent. Liberal out rebounded DCHS 30-24. Liberal is 19-1 and wins the WAC at 7-1. Dodge City is 10-10 and 4-4 in the WAC. Liberal will host a sub state game Wednesday night in the Big House on Talkradio 1270 and kscbnews.net.